In summer no less than around 9 million people1 tend to visit Spain for a holiday. With its hot climate, beaches, culture and excellent food, it’s no surprise that it is so popular. However, whilst tourists take in the sun and sangría, daily life for the local people is as hard as it’s been for decades. Rising from the ashes of an oppressive dictatorship, Spain became an example of how an EU member could develop. 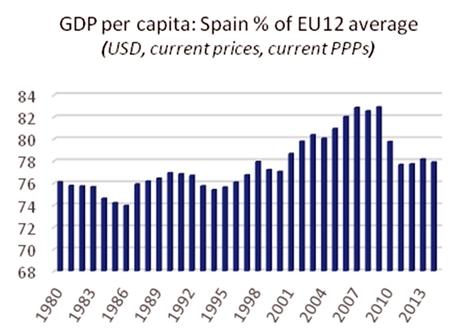 From joining the EEC in 1986, until the global financial crisis hit, Spain’s per capita GDP consistently gained on the EU average (see chart 1). Chart 1 - Source: OECD. 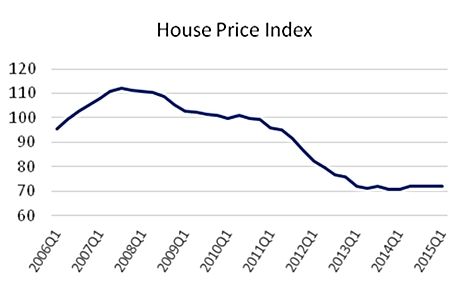 Then, the height of the Spanish bubble came as the US housing market was about to burst, leading to the global financial crisis (GFC). By 2006, the ECB’s base interest rate (EURIBOR) was more than double that of just three years previously.5 As some 94% of mortgages in Spain are based on variable interest rates,6 monthly repayments quickly became much higher at a time when employment figures nosedived (see chart 4). 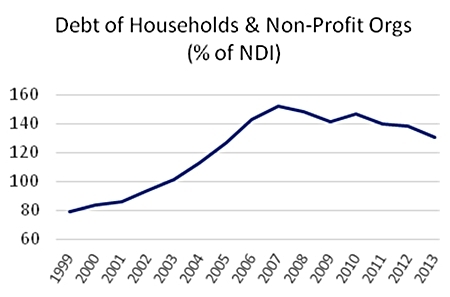 The national government was also adversely affected by the burst: its public debt rose by 133% between 2006 and 2012 – and is still rising today.11 Some of this was down to money used to bail out the banking system. However, the main reason was that government spending had increased significantly between 2000 and 2009.12 This expenditure had been largely covered by revenues from property-related taxation;13 once the bubble burst and people stopped buying houses, government revenues took a hit (see chart 5). Despite the sharp upturn in public debt, the percentage of Spanish public debt to GDP was at under 47% when austerity was announced. By comparison, Greece was at 106% and Germany at 54%. 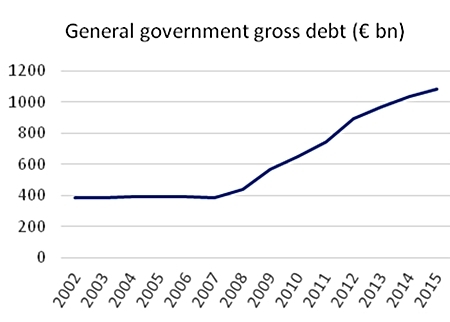 By the end of 2014 Spain’s debt had reached 78%; but then GDP fell by 1% on average between 2009 and 2014,17 so the debt figure is not as dramatic as at first glance. Also, the recent past has shown that the way to increase government revenue is to encourage a growing economy, not a shrinking one. After all, a government’s budget is not a giant version of an individual’s bank account. As Prof. Steve Keen, my colleague at IDEA Economics, pointed out in his 2015 Outlook paper,18 if a government runs at a surplus, it means that it’s getting more tax from the private sector. Thus, the private sector is earning less – and therefore likely running up debts – in order to keep the government in surplus. Proof of this in Spain is that private consumption is falling: Q1 year-on-year consumption has dropped by 2.6% between 2006 and 2015. So it looks like Spain is heading for the debt deflation that has hampered Japan for the last 25 years.19 As with Greece, it is in the Eurozone, so is straight-jacketed regarding monetary policy. It’s time for austerity to stop before it’s too late: the government of Catalonia, Spain’s richest region, has declared its next elections in late September as a plebiscite on whether it remains part of the kingdom.20 Otherwise before the national government acts, the bell could already have tolled. Paul Gambles has completed CFA level 1 and is licensed by the SEC as both a Securities Fundamental Investment Analyst and an Investment Planner. 7 William Chislett, Spain’s Banking Crisis: a light in the tunnel, Real Instituto El Cano, 2014. China is playing the markets, but what’s it all about? Stock market crash emphasizes need to reassess approach… unless you already had it right! 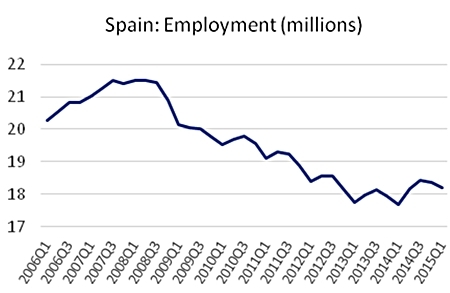 Spain: The bell is tolling on austerity but is anyone listening?